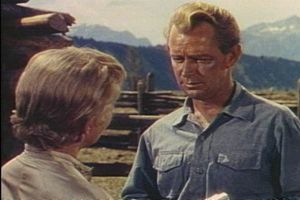 Shane stars Alan Ladd as a well-mannered gunslinger who is so well-behaved and polite as to be unbelievable. Blond haired and youthful he does not embody the role of the world-weary cowboy he is supposed to be. As a western it tries to be fair to the Ryker baddies, recognising their position and allowing them to put their point of view. However it is firmly behind the cleansing balm of Shane’s gun, which – whilst never being drawn first of course – removes all the threats from the locals and allows them to live in peace. Questions about the necessity of good men doing bad things to protect those they love barrel along with every punch and gun shot. As an examplar of the all-powerful stranger with almost mystical powers Shane is well-judged if mis-cast. Should it be No.3 on the AFI list of top Westerns? That’s too high, although there is something in the muted colours that makes the film more visually impressive than many a cowboy adventure.